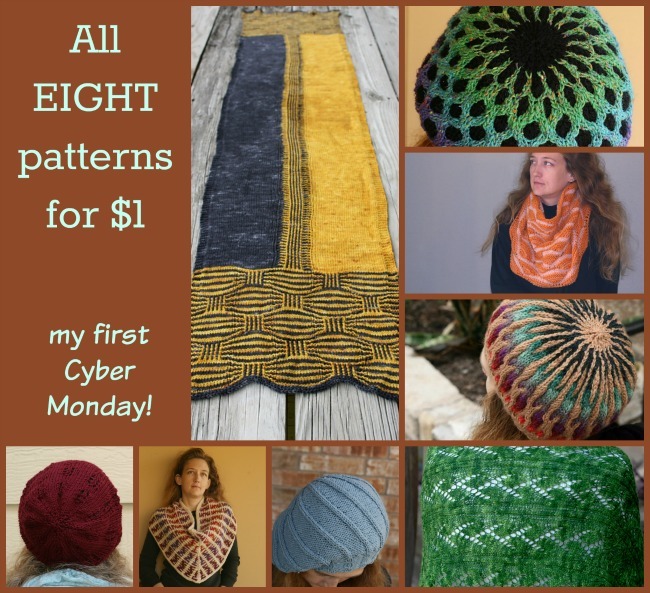 This is my first Cyber Monday as an independent pattern seller. I think that means I’m supposed to have a sale. I’m kind of excited about having a sale. I’m kind of nervous that I forgot something when I set up this sale and it will all go haywire. But ravelry claims its easy so I’m taking the plunge. 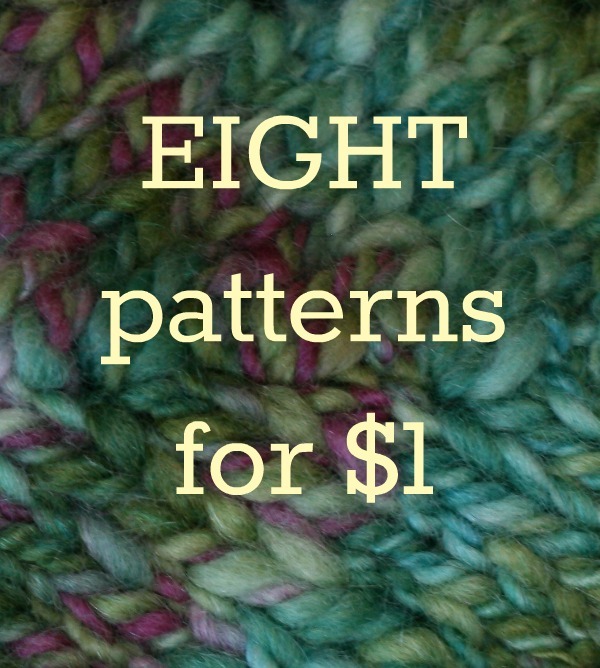 All eight of my published for-money patterns are on sale for $1. Can you believe there are eight of them? Me neither. I experienced a moment of shock when I counted them all up. Sorry but this promotion has ended! That should put all eight patterns in your basket. If you already own one of my patterns don’t take it out of your basket! That seems to mess things up. The discount only applies if all items in the discount bundle are in the basket and ravelry tells me that any previous purchases you’ve made will be counted towards this promotion. this promotion ends at midnight (Central Daylight Time) on Dec 1, 2015. Better go get your new patterns now! I hope everyone had a lovely, safe, and wonderful Thanksgiving holiday. I hope you all got as much pie as you wanted. And if you didn’t want any pie that puts you in the minority because I have been listening to tales of “the best pie I’ve ever had” for three days. It sort of makes me wonder why we Americans don’t have more pie, more often. We seem to really, really like pie. But ignore that pie-filled digression. Go get your patterns and then share this promotional with a friend or two. I mean as long as you got in before the first 500 cut-off you can afford to be generous right? Right! And then start looking around your stash for two colors of worsted weight yarn because we’re gonna have a quick knit-a-long. I’ve been asked to work up another Meshed for a store sample. That’s awesome for me because store samples sell my patterns. You however should really make one for yourself. You deserve this hat for Christmas. 21 Comments on "All My Patterns for $1 – a sale"
Done! Thanks Jen. Is the knit-along on the Mesh beanie? Here? I’m in! Yes it is! I just heard from on the the LYS that I work with and they asked for a Meshed to keep in their store. How could I say no? So a Meshed knit-a-long we shale have! And a very Merry Christmas to you too Jenn! giggle. You are most welcome! Wow! Merry Christmas to me and thank you so much Jen. If I can just knit faster, I will be all set ? You know I have that same problem. I really need to be a faster knitter. No matter how much I knit I feel behind! Glad you like ’em. Enjoy! Thank you for the awesome discount!